Hey all! So...we've run out of black Kensingtons. Yep, there are, like, five pairs left. So I thought I'd try something new - a "Re-Pre-Order," to help us raise funds for the next order of black Kensingtons. 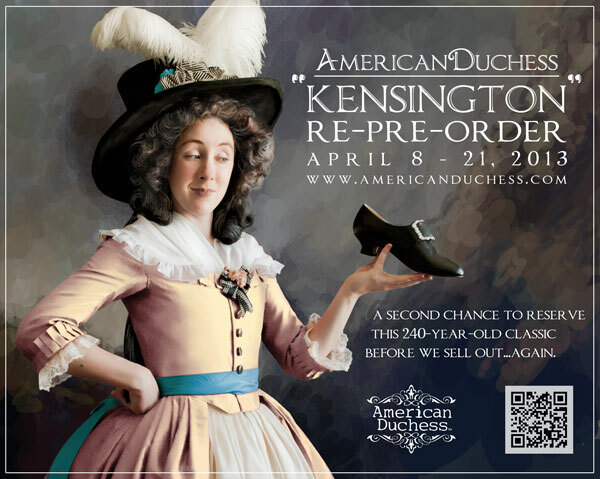 Kensington in black has been our most popular 18th century shoe, and for good reason - it's stylish, comfortable, and period correct, c. 1770-1790. You can pair it with all classes of dress, and wear it out in the fields, in town, or to a formal events. Any chance you'll be re-releasing some of the other styles in the future? Hi Olympe - yes, I think we'll do re-pre-orders on Pompadour and Astoria too. The the only ones not coming back of the current collection are Pemberley, Georgiana, and Devonshire (Georgiana has a replacement on the way, and Devonshire was replaced by Kensington). Oh fantastic! I will anticipate with pleasure whatever replaces the Georgiana, and would love another pair of Pompadours.